but I forgot to take a picture of the inside! duh!! I used my madison window die, and marianne bird on a branch die. Hubby "encaustic-ed" them for me. Some little punched gold butterflies to finish. and Grandma loved them, so I thought I would make her some for her too. 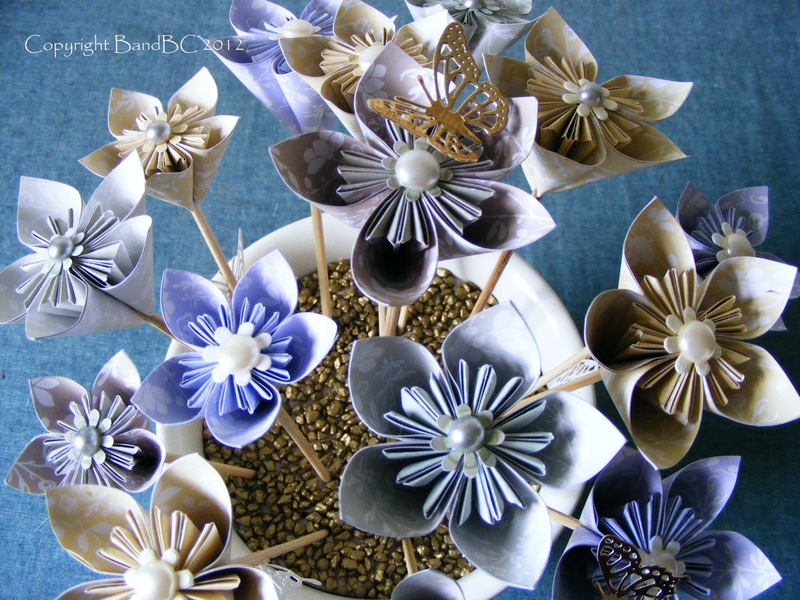 They are a form of origami I suposse, because each petal of each flower is folded, very precisely. Then 5 petals are put together to form a flower. These took a VERY long time to make, but they were worth it when I saw her face! had to add a bit of colour here and there, as they are flowers, afterall! 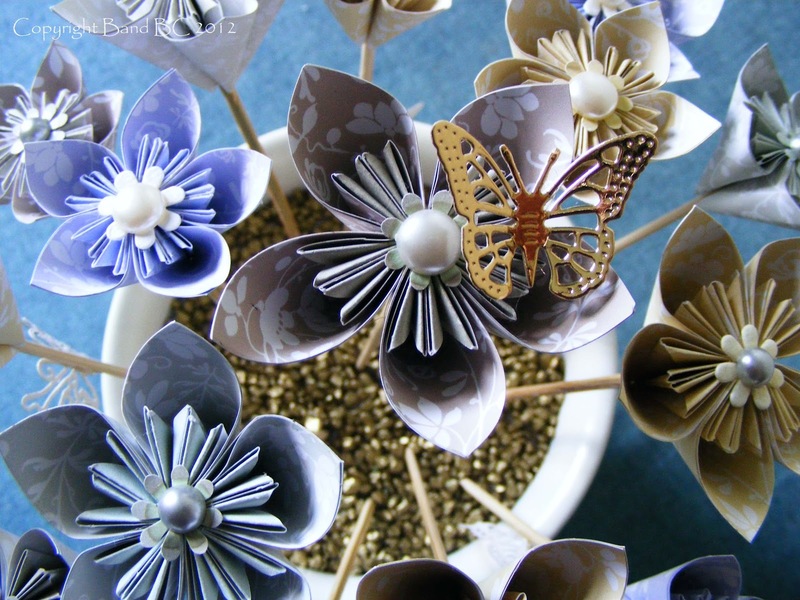 I diecut some butterflies and added one or two on petals, and on the "stalks". The flowers are held held in in oasis, which has been covered with that little gold gravel stuff. as the cats often go nosying around and knocking things off, lol!! 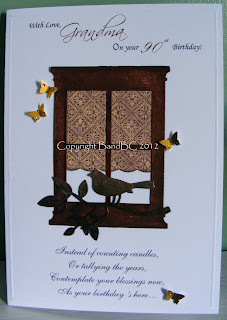 Absolutely gorgeous - I love the window frame die. Just beautiful. Those flowers are wonderful too. Lucky grandma. 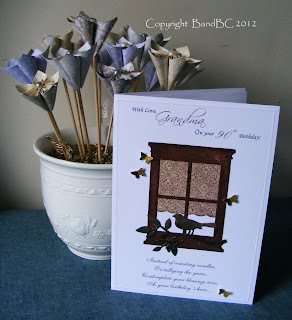 Gorgeous card , love the window and the verse, and beautiful flowers, I am just making some of these to make into a kusudama ball, hope mine look as good as yours. Stunning card and flowers your grandma will love them. Wow, the flowers are just stunning! A fantastic project. And I love the beautiful card. Wow, the flowers are fantastic and the card is lovely. Wow! The card is gorgeous and those kusadama flowers are just stunning, I bet your Grandma absolutely loved them, but then who wouldn't? A gorgeous card and I absolutely love the flowers, gorgeous for a present! I need to learn how to make them.